Since 1987 Los Angeles–based artists Mike Kelley (b. 1954 in Detroit) and Paul McCarthy (b. 1945 in Salt Lake City) have collaborated on a number of videos, installations, and sound projects in addition to pursuing their individual work. Both artists are known for their complex and occasionally disturbing works that criticize mass culture’s perpetual reinforcement of authoritarian power structures. Heidi (1992) is based on Johanna Spyri’s 1880 children’s novel Heidi's Years of Wandering and Learning. Popularly known as Heidi, the novel presents parallel dichotomous relationships between nature and culture, the country and the city, and health and sickness through the story of the young Heidi’s adventures. 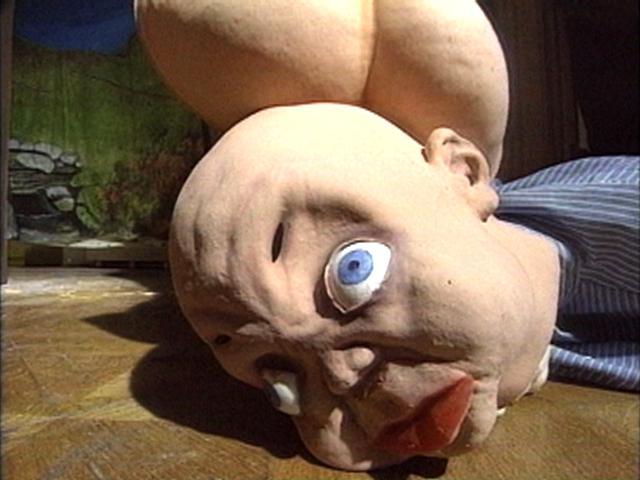 Both a parody and a critique, the video was taped on an elaborate set that was later presented as part of a large-scale installation titled Heidi: Midlife Crisis Trauma Center and Negative Media-Engram Abreaction Release Zone (1992). The epic sculpture included rubber figures and body parts, backdrop paintings, and various props used in the making of the video, as well as the video itself. Kelley and McCarthy employed horror film conventions in their video adaptation of the classic story to emphasize the creepier aspects of the dualistic worldview that it espouses. Subverting the tale’s morality codes to the extreme, the artists explore the intellectually and sexually repressive social hierarchies outlined in the original story and extend Spyri’s oppositional pairings to encompass modernism and popular culture and the split nature of their own artistic collaboration.